Echinacea Purpurea has been referred to as nature's best immune system enhancer, it is believed to be one of Mother Nature's most powerful natural antibiotics. Indigenous to North America, Echinacea root has been widely used against colds and other infections. Echinacea has played an important role in North American medicine. It has been beneficial in suppressing viral activity and promote an immune stimulating effect through the activation of T-cells. Echinacea purpurea appears to seek out and destroy mutant precancerous cells. Echinacea is especially good for cleansing the lymph system and the glands, therefore it is used to treat strep throat, swollen glands, prostate problems, sore throat, ear infections, and tonsillitis. Echinacea purpurea relieves symptoms of chronic fatigue and reduces opportunistic infections in HIV individuals. Echinacea is called an anti-inflammatory and an effective agent that works to reduce the pain and swelling from injury and combats all types of inflammation, including a sore throat, tonsillitis, and hemorrhoids. Echinacea combined with honey is particularly effective for the treatment of vitamin deficiency, severe headache, chronic fatigue, high blood pressure. This mixture normalizes sleep, calming the nervous system and when taken regularly may help with epilepsy, hyperactivity, atherosclerosis, improve vision and memory. Referred to as an antifungal, Echinacea purpurea is said to be effective against vaginal yeast infections, such as Candida, and other fungal infections. This herb is not an everyday tonic. Rather, use it when the body really needs it and its effectiveness will be much greater. Applied topically, it helps to heal skin infections, psoriasis, eczema and other inflammatory skin conditions, wounds, cuts, burns and insect bites. 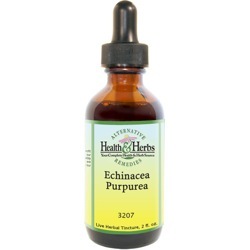 Echinacea Purpurea works by helping to crank-up the immune system to ward off disease and infection. Considered an antiviral and antibacterial, Echinacea not only kills bacteria and viruses but also actually strengthens immunity by increasing the number and activity of immune system cells in the bloodstream, including anti-tumor cells and promotes T-cell activation, and it helps white blood cells attack germs. Those who regularly come into contact with sick people, such as nurses, doctors, and other health professionals, may benefit from taking a daily Echinacea supplement, especially when there are a lot of viruses about. Many people with HIV have used Echinacea purpurea because it stimulates the immune system, or for short-term treatment of colds and other viral infections. Extracts from E. purpurea have consistently provided the most robust inhibition of HIV with little or no cytotoxicity. Increased concentrations of the herb extract had antiviral activity when tested for the virus, and this species contains the anti-HIV compound cichoric acid and has been shown to inhibit HIV replication. One study suggests that the use of Echinacea will have a positive effect on cold sores and other opportunistic infections triggered by herpes simplex virus (HSV1) when taken prior to infection. Echinacea is considered one of the most effective detoxing herbs in Western medicine for circulatory, lymphatic and respiratory systems, particularly E. purpurea, which is considered more potent than other species. Echinacea purpurea increases the "non-specific" activity of the immune system. In other words, unlike vaccines which are active only against a specific disease, it helps to stimulate the overall activity of cells responsible for fighting all kinds of infections and helps prevent bacterial access to healthy cells. It is an excellent lymphatic tonic, cleansing the system of toxic materials, and it can be particularly helpful in cases of swollen glands and enlarged prostate. Further supporting Echinacea's role as a depurative, or agent that tends to cleanse and purify the blood by killing contaminants in the blood, the herb is believed to be effective in the treatment of blood poisoning and septicemia. When taken in conjunction with common cancer treatments and according to a study done at Loyola University, some malignant diseases have been treated with Echinacea and the effect of chemotherapy may be improved with its use. Echinacea will bolster your immune system. and along with Astragalus, it may be powerful enough to prolong survival. Chronic fatigue syndrome may also be helped with the powerful extract, according to recently established Echinacea facts. By boosting the immune system, it may be possible for Echinacea to cure the persistent exhaustion of chronic fatigue syndrome by destroying any stray virus which has been linked to the disease. At the first sign of a cold or other viral infections, fever, earache or whenever antibiotic action is required, take Echinacea. It is said to ward off all infections, or at least diminish their length and severity. For the prevention and treatment of upper respiratory tract infections, E. purpurea is believed to be the most potent species of this plant has been found to be very useful in cases of bronchitis. Echinacea Purpurea is said to promote good digestion and help with flatulence. It also cleanses the stomach and helps to expel poisons, toxins and abscess formations in the body, such as gastric ulcers. As a sweat-producing agent, Echinacea even slows down the aging process. It beautifully cleanses wastes and detoxifies through the skin, rejuvenating the entire body. Echinacea should only be taken for a month and then take a break for a month, allowing the body to put its immunity into full force. Echinacea Purpurea is believed to promote tissue regeneration. Torn ligaments also respond well to the plant and it is often used in healing salves in combination with St. John's Wort for scarring from surgery and other wounds. Used both internally and externally, Echinacea's effects as a healing herb for all types of skin problems and infections are said to be legendary, helping to ease cuts, cold sores, boils, carbuncles, acne, sunburned skin, infected or weeping eczema, plant poisoning (ivy, etc. ), herpes lesions and other infected skin conditions, even gangrene. By aiding in the prevention of any potentially dangerous bacteria, Echinacea allows the body to focus more on healing the wound than stopping infections quickly. Ingredients: Echinacea Purpurea Root, Structured Water, 20% Alcohol. Non-Alcohol: Echinacea Purpurea Root, Structured Water, and Vegetable Glycerin. Contraindications: Echinacea Purpurea is not recommended for pregnant women, individuals suffering from autoimmune disorders, those with allergies to daisies/ragweed/sunflowers or those receiving organ transplants. If taking prescription drugs, it is always wise to speak with a physician, as Echinacea may counter the effects of certain medications. Echinacea should not be given to children under two years, nor should it be used orally in long-term diseases, such as multiple sclerosis, tuberculosis, collagenosis, HIV or AIDS and autoimmune disorders (like lupus or rheumatoid arthritis).